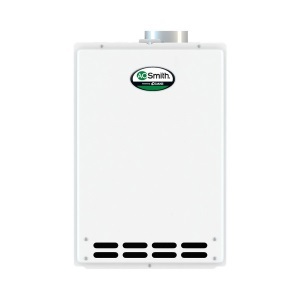 Explore small and compact AO Smith tankless water heaters, designed for on-demand heating of potable water in residential and commercial applications, without occupying the floor space. 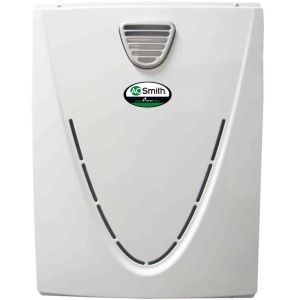 What to look for and review of the best of AO Smith - condensing water heaters, engineered to provide hot water in endless supply, with high flow rates and ultimate efficiency. Check out the best models to buy. 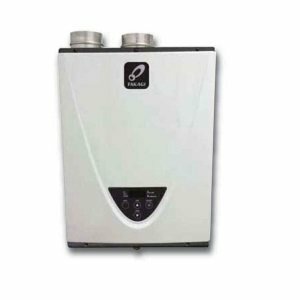 AO Smith tankless water heaters are divided into three groups for residential and light commercial use, all mostly set to use natural gas, which can also, with the correct conversion kit, use the liquid propane. Several types and sizes are available, from the economy, such as non-condensing, to the advanced condensing models with the built-in recirculation pump, ultimate efficiency, and ultra-low NOx - all coming from the ProLine XE series. Tankless water heaters from these groups are the simplest of all tankless from AO Smith. As they are equipped with only one heat exchanger, these non-condensing units are available as indoor (ATI) with the power or power direct vent, or outdoor (ATO) - ventless, also with the ultra-low NOx (U) and concentric vent (C) option. ATI-510 is the best, also the largest non-condensing tankless model to choose as it comes with the durable commercial grade copper heat exchanger, high energy factor of 0.82, the maximum flow rate of 10 GPM and capability to connect up to 4 units into one system. The users mostly like its compact size, nice appearance, reliable operation and endless hot water, while the main "issue" is the long wait time than the tank-type. An even better model to buy is ATI-510U, due to the ultra-low NOx emission - great for environment conscious users, integrated control panel and, Multi-Link, an addition to Easy-Link, so up to 20 units can be part of the big system - delivering more power and hot water. This is the series that is consisted of ultra-efficient and ultra-low NOx, condensing tankless water heaters, where the energy factor is over 0.90. Indoor models have the temperature controller built-in, while the outdoor model comes with the wall mount controller. Model 540H is the largest and most powerful model - one of the top models to buy, and, as the 510 series, is built for heavier hot water usage - 10 GPM water flow and capability to use an Easy-Link and Multi-Unit system. 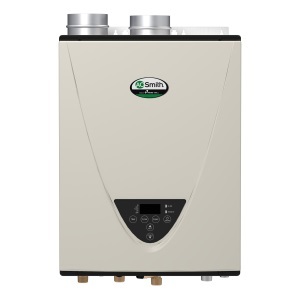 AO Smith tankless water heaters are designed for on-demand water heating at the point of service and for the whole house use, supplying hot water to one or several applications at the same time; also for high demanding applications such as to fill up the whirlpool tubs, or simply supplementing primary storage tank-type water heater. 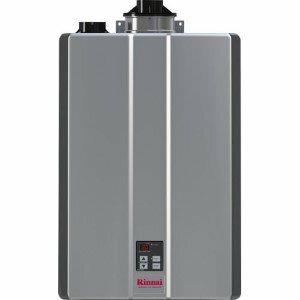 The best AO Smith tankless water heaters are those with the high efficiency and condensing technology, using not one as the standard type, but two heat exchangers. The primary heat exchanger is made of the thick, commercial grade copper - hard and durable, while the secondary is made of the corrosion-resistant, stainless steel for utilizing the "already lost" heat from the flue gases. This way the total efficiency is significantly increased where the energy factor is over 0.90. For example, one of the best tankless models, 540 series, utilizes a recirculation pump for fast hot water delivery and has the energy factor of high 0.93, meaning that only 7% of energy is wasted. This is the largest tankless unit, and with the flow rate of 10 GPM is recommended for homes with up to four showers. AO Smith tankless water heaters that are built for indoor use are coming with the direct venting system, and sealed combustion, so the water heater can only take the fresh air and vent the gases outside, keeping the inside air protected and untouched. Non-condensing units are using Category III stainless steel venting while condensing cheaper PVC pipe as the temperature of the exhaust gases lower. The tankless installation allows flexible venting, which includes a long vertical or horizontal run through the roof or walls. The outdoor units are ventless and have great advantages as the outside installation saves the valuable indoor space, and any leak of the products of combustion or gas stays outside. A recommendation is to install the outdoor unit inside the recess box for protection from the elements, which is available as the optional accessory. AO Smith gas tankless water heaters are providing hot water in continuous supply only when it is needed - on demand. These can provide enough hot water for several fixtures simultaneously, where the water flow of 10 GPM, as found on the largest unit ATI-540H is the maximum available. Up to four units can be connected into one system without purchasing any additional part or accessories, or up to 20 units connected into one system with some modifications. In a situation with the high volume conditions, (4 and more showers) found on heavy-duty water heaters, such as series 510 and 540, AO Smith includes the durable bypass and flow adjustment valves, so that units can handle with less stress. 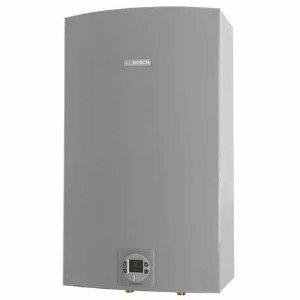 If you are looking for the tankless water heater for one to three showers, small and medium-size homes, series 110, 140, 310 and 340 are recommended. Electronic ignition, temperature and other heating processes inside the AO Smith tankless gas heaters, are monitored by the electronic control board. This is what helps one unit to have high performance, accurate temperature control, simple diagnostics, and troubleshooting. The built-in display shows the temperature and error codes if the problem occurs. The remote controller is included as the standard feature on some models, and it shows the current inlet and outlet temperature, flow rate, error codes when the fault is detected and allows you to increase or decrease the temperature of the outgoing hot water - very convenient feature. Air-Fuel Ration Sensor or AFR ensures proper air/gas mixture for the clean gas combustion inside the combustion chamber. This way the gas emission is reduced, the performance is optimized, and parts can last longer. Overheat protection will shut down the unit if the pre-set temperature is exceeded. Power failure protection will cut off the gas supply to the unit if the unit loses the electrical power. Flame failure protection allows the tankless heater to shut down if for any reason the burner flame is extinguished. A fusible link would break to shut off the tankless water heater if overheat protection didn't prevent the temperature from rising. Power surge fuse is the glass fuse which blows in a case of the over-current. Internal freeze protection, an essential feature when the unit is exposed to cold weather. AO Smith tankless water heaters come with the 15-year limited warranty on the heat exchanger and for residential water heating, 6 years in the commercial application (or 10 years on 510 and 540 models) and 5 years on all other parts. The long warranty and advanced features are what makes tankless models the best type to buy.